Have you ever thought that, SOLIDWORKS might save your day from a frustrated day? Still using the conventional way to do product design, trouble correcting the error in drawing? Still need to do measurement for the whole assembly model, with consume high amount of time? SOLIDWORKS can be the hero to save your day. With the analysis tools in SOLIDWORKS, we can always easily check our solid model with the minimum effort, with a click of the button. Doing product design in 2D could be the fastest way, but to train up such experiences and skills, take ton of times to trained up the engineers. Why we still want to convince you to try out SOLIDWORKS? Because SOLIDWORKS could be the software that solve your million problems in the manufacturing industry. Over the years, the AE from Dassault Systèmes, spent ton of time and effort to develop the software interface. All the enhancement and improve included in SOLIDWORKS over the years, mainly to ensure the SOLIDWORKS always to be easy to use by everyone, to becoming a friendly tool that helps the designer to design, prototype, and stylising their product with the minimum effort. The software had been designed base on window interface over the years. When the new user tries to use the software, they feel more familiar with the button, shortcuts in the software. Window base designed icon and button, allow new user to adapt with the software. The SOLIDWORKS separate the function and features in command bar, to split out the features in different stages. The sketch features, is the section that allow user to use entities to draw 2D sketch; Whereby features section, is the part where the user can transform their design from 2D line to 3D solid models, other function that can be found in the features section, such as extruded cut, hole wizard, section that ease the user to do modification on their existing design without compromising the 2D sketch line. Entities function can always be found in the command bar. Features that often used for 3D model, such as extrude and fillet. To reduce the cursor travel to command bar, to select entities during sketching, SOLIDWORKScreated a shortcut to direct access the entities options, by simply right click your mouse, and select the entities options to do your sketching in SOLIDWORKS. Enhancement that save user time to search and browse for entities function. Smart phone provide user to define their shortcut with the smartphone gesture. But do you know that, gesture shortcut also can be found in SOLIDWORKS. By right click and hold right mouse button, allow you to use the shortcut you define in the gesture, including features, and entities shortcut. In SOLIDWORKS 2018,SOLIDWORKS allow user to set up to 10 shortcuts in the mouse gesture, to ensure the user always pick up the pace to use SOLIDWORKS. Generally, SOLIDWORKS split into 3 main sections, which are part, assembly and drawing. Three main function in SOLIDWORKS, Part, Assembly and Drawing. Part feature, is where the user uses the function to create a single model component. Before everything come into 3d modelling, everything back to basic. We always need to have a complete 2d sketch entities, transform it into a 3d model. Two main features will be frequently used in SOLIDWORKS part mode, which are sketch feature and applied feature. 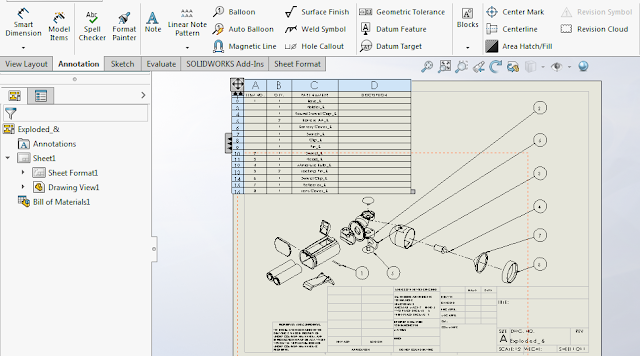 Before we start a sketch, SOLIDWORKS provide us standard 3 plane for sketching. After we complete our sketch, we can use smart dimension to complete our drawing. Sketch features and applied features can be found in command bar to transform our sketch into 3d model. Sketch features like extruded, revolved, required a profile or complete sketch to become 3d solid model. Applied features such as fillet and hole wizard, can direct apply on 3d model without sketch. Once the user completed the model process, the user allowed to assemble all the components in the Assembly feature. Where mate function is the main function, the user needed to combine the component, and define the movement of the components in SOLIDWORKS assembly. We able to combine all components in assembly, including torchlight and vehicle’s motor. SOLIDWORKS drawing consider as the final part, whereby the designers or users, use this function to fine tune their production or modelling in 2D drawing, to ensure the vendor able to fabricate their product via 2D drawing. Provided with linking function in SOLIDWORKS, the software only required the users to press a few ticks to generate 2d drawing. Generating 2D drawing, never been easier than before. Synchronizing features in SOLIDWORKS, is the other best part of story in SOLIDWORKS. When there’s a change in the part file, the SOLIDWORKS will always automatically rebuild the assembly and drawing, to ensure the model get to the latest update from the designers and users. Saving a lot of time and effort for skipping the cross-checking process. Before and after I change the dimension of the 3D model in SOLIDWORKS. Both dimension in assembly and drawing update, and the shape changed as well. Stay tune to the second part of the article! If you wish to know more about SOLIDWORKS, please visit our website or visit us at IME PJ, Penang or JB branch.